From time-honoured dance halls to extraterrestrial planets, Gucci’s Alessandro Michele has been known to hail inspiration from far and wide, past and future for his seasonal collections. For Cruise 2018 shown last May, it was closer to home, but further back beyond his go-to ’70s: Dubbing the collection “Renaissance Rock ‘n’ Roll”, Michele’s eclectic oeuvre collided with Ancient Greek ideals. And now that the Athenian offering trickles into Gucci boutiques in time for the festive season, here’s where Spanish artist Ignasi Monreal steps in. 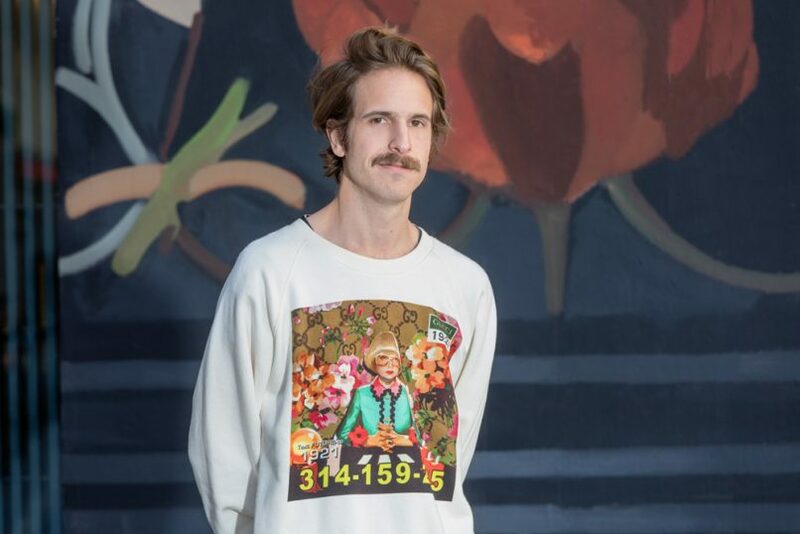 Ignasi Monreal in the Gucci sweatshirt bearing his first #guccigram print. The piece is included in his capsule collection of tees and sweatshirts for Spring 2018. Monreal first collaborated with the Italian house in 2015 for the #guccigram project, an Instagram initiative inviting digital creatives to rework iconic Gucci patterns in any way they see fit. His was a GIF piece featuring Michele’s bowl-cut haired magpie as a fortune teller who’s thoughtfully looking into your future through her XL gold-rimmed glasses with glistening sparkles that are way ahead of Kirakira+’s epoch. Fast forward two years, the print found its way onto a t-shirt as part of Gucci’s Cruise 2018 runway show, before getting spun into a special capsule of tees and sweatshirts — all bearing Monreal’s original artworks — which is now available in stores. Artworks from Monreal’s in-app digital Book of Gifts. It’s no surprise then, that Monreal was called in yet again to interpret Michele’s classical vision for the season’s Gift Giving campaign. 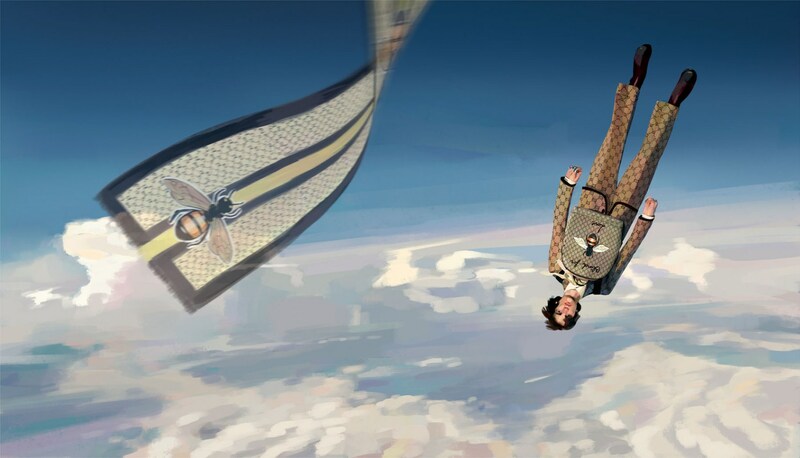 Designing a digital world in the Gucci app, Monreal interweaved a visual storyline inspired by the tragic tale of Icarus with your favourite Gucci pieces — loafers, brooches, fanny-packs, shoulder bags, homeware, and childrenswear — bejewelled to the nines in a post-Internet Grecian mythology dimension. Keep scrolling and you’ll see a unicorn-pegasus lying down on a parking lot just a stone’s throw away from a pair of crystal-embellished pink velvet Princetown slippers, or a lone Ignasi Monreal-designed graphic sweatshirt bouncing on a trampoline set in front of a columned edifice as a five-year-old would. Like what you see? Simply tap to shop. Ticking off your year-end gift list has never been more meta-cool. 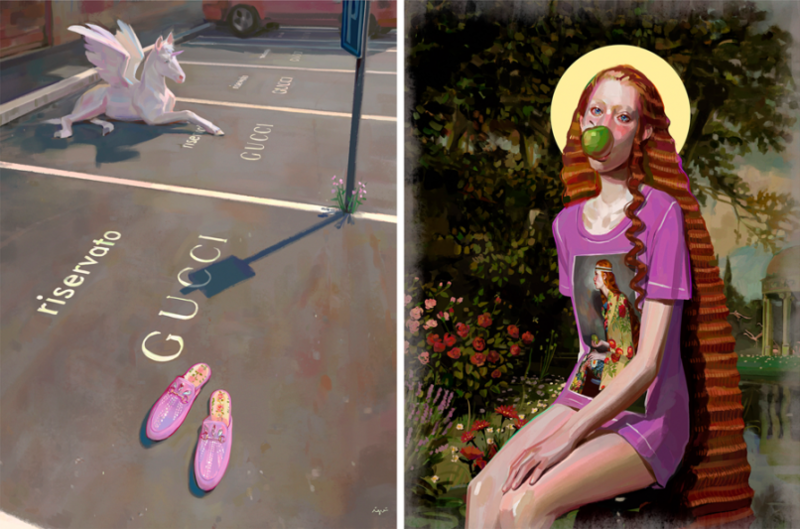 To experience Ignasi Monreal’s interactive Gucci Gift Giving campaign, download the Gucci app on iTunes or Google Play. Shop his collection of graphic tees and sweatshirts in stores.